An AC-130W Stinger II, one of the newest variants of the lethal gunships known for providing a stream of accurate air-to-ground fire support, was filmed recently on a mission over Syria sporting a holographic rifle sight. The Air Force released the video showcasing the AC-130W heading out to provide close air support for U.S.-backed Syrian Democratic Forces in Syria on July 23. At the video’s 1:14 minute mark, an EOTech holographic rifle sight can be seen apparently mounted on the left side of the cockpit, next to the pilot. The weapon sight, often mounted on M4 carbines by U.S. ground troops, was first spotted by The War Zone. Captain Ryan DeCarlis, an AC-130W pilot at the 16th Special Operations Squadron, told Air Force Times the EOTech is used to help sight-in the instruments pilots use when conducting air-to-ground fires. When AC-130s are attacking, they fly in a counter-clockwise pattern around a target, because their cannons are all left-facing. This is called a pylon turn, and it allows the gunship to fire at targets for extended periods of time without having to make multiple passes. Given the grave danger to friendly forces if the pilot lost situational awareness, weapons precision is extremely important. The gunship’s combat systems officer — who sits in the hull of the aircraft — is responsible for aiming the aircraft’s 30 mm GAU-23 cannon. But the pilots are still responsible for using the pylon turn to maintain an imaginary line projecting straight out the side of the aircraft and to a fixed point on the ground. The HMD helps them maintain that steady stream of accurate fire for ground forces. 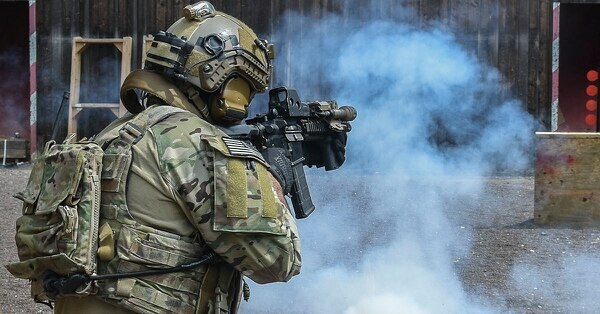 As for the EOTechs the pilots are using, while those are issued ones from their squadrons, the sights can also be purchased commercially for around $500 to $700. Like DeCarlis, the aircrew featured in the video is deployed from the 16th Special Operations Squadron, out of Cannon Air Force Base, New Mexico. The squadron is often responsible for conducting missions alongside special operations ground forces. The AC-130W’s primary missions are close air support and air interdiction. The gunship is capable of reacting to troops in contact situations, providing convoy escorts and conducting point air defense. 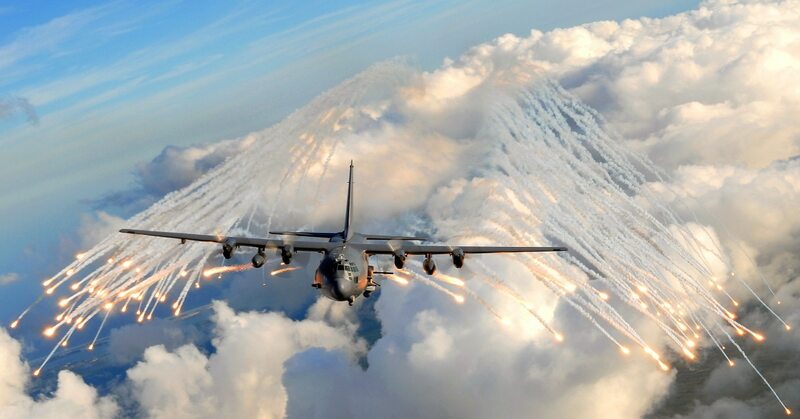 In addition to the 30 mm cannon, the AC-130W is known to be armed with standoff, precision-guided munitions and the GBU-39 small diameter bomb.